The long-closed Anchorage Marine, which has been something of a blight on Cornelius’ landscape for a while now, is going…going…almost gone. On April 3, 2017, the Town of Cornelius Board of Commissioners approved the property’s rezoning, which was requested by Old Swan Development, LLC of Chapel Hill, the new owners. Construction on the 3.6-acre site is now ongoing, and the public is being invited to the anticipated launch that could happen anytime soon. BoatYard Eats is a first in Cornelius. Its innovative concept combines the food truck experience with a casual restaurant and bar setting, complete with live entertainment. The developer envisions Cornelius to serve as the restaurant’s launching market, with expansions to other markets in the horizon. BoatYard Eats will be a place where family and friends can gather in a relaxed, laidback atmosphere to enjoy the offerings of local food trucks and breweries as well as performances by local and national talents. The dress code is informal – guests can come in flip-flops and t-shirts – and there will be no reservations. Seating is flexible to comfortably accommodate as many people as possible. And dogs on a leash are welcome. BoatYard Eats is keeping the existing Anchorage Marine building, which is being repurposed into an indoor dining area and bar with an attached covered patio. David Stockwell, the CEO of BoatYard Eats, also serves on Cornelius’s historical preservation committee and wishes to preserve the building for its contribution to the community. Its corrugated metal construction is expected to enhance the casual, informal vibe. 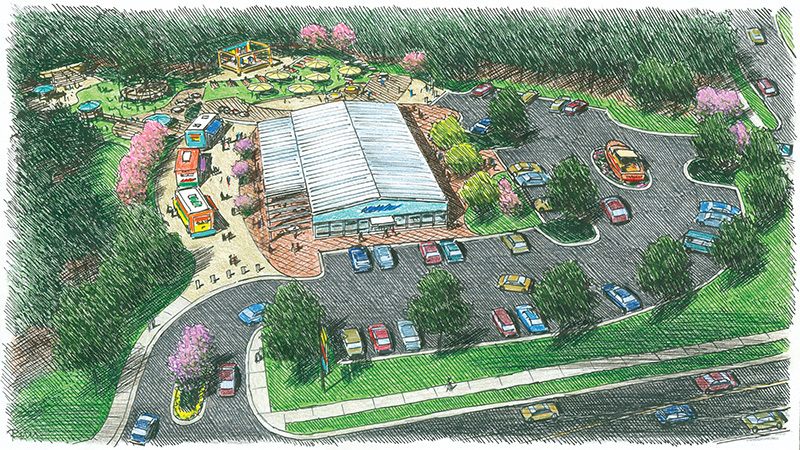 Outdoor seating will also be available in an entertainment area that features a stage for live performances. There will be three permanent parking spaces with electrical hookups where food trucks will be set up. Ample parking will also be provided. Customers will have a great time discovering new and innovative cuisines from the best local food trucks. There will be a rotating menu to allow the community to experience all kinds of eats, until favorites are established. The restaurant’s in-house kitchen will be serving a limited menu with a signature dish to be offered every day. BoatYard Eats is not a brewery – drinks from local breweries will be served instead. Two stages are planned – one indoors and the other outdoors. Entertainment will come from local and national acts, and will be rotated regularly. Westmoreland Road is the tail end of the McDowell Creek Greenway, a 1.5- mile walking and biking trail that connects the thoroughfare to Highway 73. Hop on the trail and hop off at BoatYard Eats to unwind. Guests on the patio are asked to be respectful of the trail, as well as the restaurant’s neighbors. The community is eagerly anticipating the launch of BoatYard Eats, which is expected not only to bring locals together but also attract more visitors to the town. Those who wish to be part of the Grand Opening Party can sign-up at the restaurant’s website here.